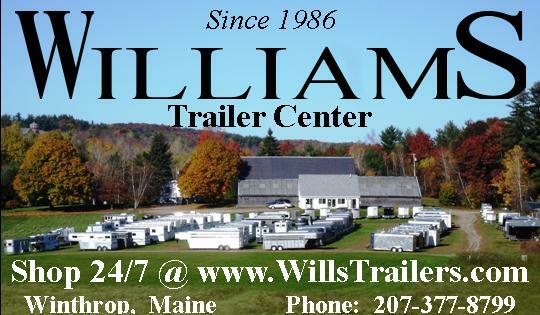 We just wanted to drop you a note to THANK YOU for your inquiry into Williams Trailer Center. We have been in business for since 1986 and are able to grow each year because of our loyal customers and friends. We look forward to the opportunity to serve you. Our goal here is to make sure that every customer acquires a vast knowledge about all of the products we offer, and most importantly we want ALL of our customers to be comfortable and confident with their purchase. We also offer robust, creative, and easy financing. We offer full trailer repairs and service on site including warranty work and annual service. If you purchased your trailer from us you will receive VIP appointment scheduling. We believe that choosing the right trailer is as important as choosing the right dealership. Our reputation speaks for itself, just ask around. We have made a commitment to this business and our customers for over 33 years and will be here for many years to come. Between us we offer you over a 110 years of experience in the livestock and cargo trailer industry! We have many years of experience in the trailer industry, so we can provide you with the knowledge you need to make an educated decision in choosing the right trailer for you. Robust selection of popular trailer models. In stock inventory that fluctuates over 135 trailers. Maintain your trailer to stay safe on the road. We know how to handle a wide range of trailer services. Do You Want To Sell Or Trade A Trailer? To start the process simply go to the Consign, Trade or Sell page in the menu above. Once you complete the form, someone will be in touch with you to continue the process. Are You Looking For A New Trailer? Our trailers are sold with all the required documents completed, with a temporary registration, and a temporary plate. We are not like other dealers, we do not charge any document fees, closing costs, or any other bogus hidden fees. We pride ourselves in care after the sale. If you need to schedule work you can always call us of course. If you would like to send a request online, visit our service page for more info. We fully understand that you, the customers, keep our business flourishing. With that, we try our best to accommodate every customer. Our goal is to make all of our customers feel comfortable and confident with every trailer purchase. We not only want to earn your business by selling you your first trailer, but we want to continue that relationship for many years to come! We operate with a “no hassle” pricing. As a volume dealer, the more trailers we purchase the larger discount we receive, which allows us to pass on the savings to our customers. We refuse to insult our customers by selling to one at a lower price than another. We offer the lowest price possible to ALL customers because you are all equally valuable to us. We have been in business since 1986, we have seen it all. Our staff is constantly researching the newest advancements to stay ahead of the curve. We have over 110 years of combined experience in the trailer industry!